The Kultala Gold Village of River Ivalojoki is managed by Metsähallitus. The State built the Kultala Gold Mining Village, also known as the "Crown Station", on the banks of the River Ivalojoki in 1870 in order to control gold digging and the gold trade. In the restored village you can sense what the life, work and dreams of gold diggers were like over one hundred years ago. River Ivalojoki's gold was discovered when an expedition sent by the Finnish Senate mapped out gold deposits in Lapland in the summer of 1868. The expedition's last destination for autumn 1868 was to the Ivalojoki, which finally fulfilled their wishes. Only after a couple of days of panning, they were certain they had found the most significant gold deposit in Lapland. A real gold rush on the Ivalojoki started in the following summer when two experienced gold diggers panned 2 kg of gold from the site. The rumour reached the ears of many across the country and soon there were one hundred men trying their luck in the Ivalojoki. The Kultala Gold Village on the River Ivalojoki is among the nationally valuable cultural heritage areas. The main building in Kultala is always open to visitors. There is no entrance fee to the buildings. More information is available at the Ivalo Customer Service and Saariselkä Customer Service Kiehinen. The trail to Kultala on the Ivalojoki starts from the end of the forest road near the Pahaoja hut. When going to Pahaoja, drive for about 15 km from Highway 4 (Laanila) towards Kuttura and turn right into Sotajoentie Road by the corner of the kiosk. Drive for about 8 km along Sotajoentie Road and turn left to Pahaoja. Once there, it is a roughly one-kilometre walk from the Pahaoja parking area to the Pahaoja hut. You may cross the River Sotajoki along the new bridge. From Pahaoja, there is a 12-km walk to the gold mining village of Kultala. The route from Kutturantie Road to Kultala via the old Rovanen Road is still visible on maps but is no longer used and has not been marked on the terrain. In places it is difficult to see the path and its use is not recommended. You can find more detailed information on directions on the Hammastunturi Wilderness Area's webpages. The relatively new Kultala hut on the River Ivalojoki is located on the grounds of the "Crown Station". 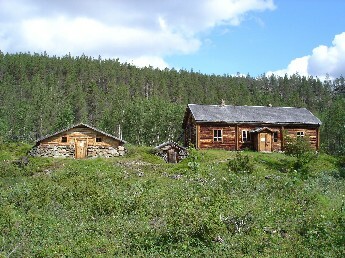 The hut comprises an open wilderness hut and a rental hut. The reservable wilderness hut is situated in the close-by vicinity. The Pahaoja open wilderness hut and rental hut are located on the eastern bank of River Sotajoki at a distance of about 500 metres from the end of the Pahaoja fork on the Sotajoki forest road (that veers off from Kuttura Road). The smoke sauna located by the shores of Kultala on the River Ivalojoki is a museum building and may not be used by hikers. There are no services for the disabled in the area. More information on the services of the Hammastunturi Wilderness Area.